Every year scores of innocent Afghan children are horribly killed or seriously maimed on the streets of Afghanistan due to the ruthless and cowardly attacks of the insurgents of Afghanistan, these beautiful children were in the wrong place at the wrong time on the streets trying to sustain a living for their family’s revenue by selling scarves, pens, Kleenex or whatever. Musician Lanny Cordola, founder of The Miraculous Love Kids / Girl with a Guitar, has collaborated with such high profile musicians as Slash and Gilby Clarke from Guns N’ Roses, John Stamos and Jodie Sweetin from the TV show Full House, the Beach Boys, Donovan, Robbie Wykoff and Harry Waters from the Roger Waters Band, Nancy Sinatra, Mark McGrath from Sugar Ray, Moby, Sen Dog from Cypress Hill, Kris Myers from Umphrey’s McGee, and several others. He has also created music with world music figures, such as singers Atif Aslam and Sanam Marvi from Pakistan, Wahid Qasimi from Afghanistan, and D2 from Bulgaria. 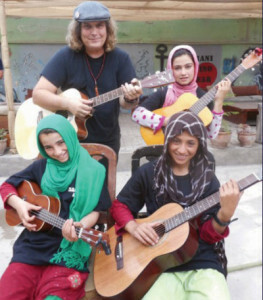 Since 2010, Lanny has focused on musical projects aimed at raising awareness, resources and funds for some of the most vulnerable children in Pakistan and Afghanistan. In the wake of his work in these regions, Lanny has formed his own non-profit, 501(c)(3) organization called the Miraculous Love Kids, based on the premise that “it shouldn’t hurt to be a child” and that a kid with a melody in their heart has hope, and with hope all things are possible. Miraculous Love Kids-Girl with a Guitar have directly impacted close to a 100 street kids since 2015 with the focus on getting the girls off the street and providing them a medium starting point moving forward through the art of music with the guitar. Primarily the target group have been young street girls ages from 7-16 years, the impact has been profound changing the lives of these girls and their families significantly. Lanny Cordola and the Miraculous Love Kids-Girl with a Guitar Charity are providing daily Life Skills with music and direct financial support to these kids. The Miraculous Love Kids-Girl with a Guitar requires immediate financial support to sustain the daily overhead and growth of the Charity. Presently funds come in from the goodwill approach and fundraising initiatives that leaves the Charity living and operating from day to day with no opportunity to grow. With appropriate funding’s MLK would be able to expand into a secure environment for children offering class rooms, studios, kitchen & dinning, teachers and security for children. With the appropriate funds mentioned the Miraculous Love Kids-Girl with a Guitar will be able to sustain a safe and secure environment for predominately the street girls entering the MLK program. With a secured sponsorship funding will give the ability directly to Lanny Cordola and the Managing Team of the MLK to focus on providing a sustainable world class music program to these future teachers of Afghanistan with the goal of opening the first Afghanistan Guitar Institution.